Brasil Guitar Duo, a 2006 winner of the Concert Artists Guild International Competition, and hailed by Classical Guitar magazine for its “maturity of musicianship and technical virtuosity,” is equally at home on a classical or a world-music series. Its innovative programming features a seamless blend of traditional and Brazilian works, resulting in a full global touring schedule and a growing catalogue of critically acclaimed recordings. The Duo has appeared internationally on major concert series and at festivals throughout the world. 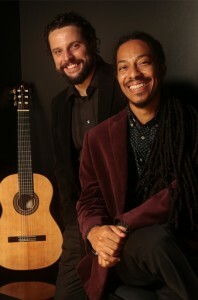 Duo members João Luiz and Douglas Lora have been performing together for twenty years, and actively strive to expand the repertoire for two guitars, with Lora contributing works of his own and Luiz arranging both classical and Brazilian music. Appearing frequently in diverse non-traditional spaces, the Duo combines a broad repertoire of classical guitar duos with such traditional Brazilian dance forms as choro, samba, maxixe, and baiao. Committed to performing new chamber music employing the guitar, the Duo joined cellists Yo-Yo Ma and Carlos Prieto in the October 2014 world premiere of El arco y la lira, a work for two cellos and two guitars by the esteemed Cuban composer Leo Brouwer. Their 2015 Naxos CD of Brouwer’s complete works for two guitars was nominated for a Latin Grammy award for Best New Composition.